A camping themed birthday party for a great-nephew who turned 1 Easter Sunday and his grandpa who turned 50 three days later! I made this fun camping cake for my nephew and a giant chocolate chip cookie for his grandpa (my brother). Here's some pictures of the decor that I did for their combined party. The decorations I made/used for my brother. I made the chalkboard printable and the tent. I covered the "E" with denim and made little hobo bags (with prizes inside) for my three great-nephews out of bandanas. 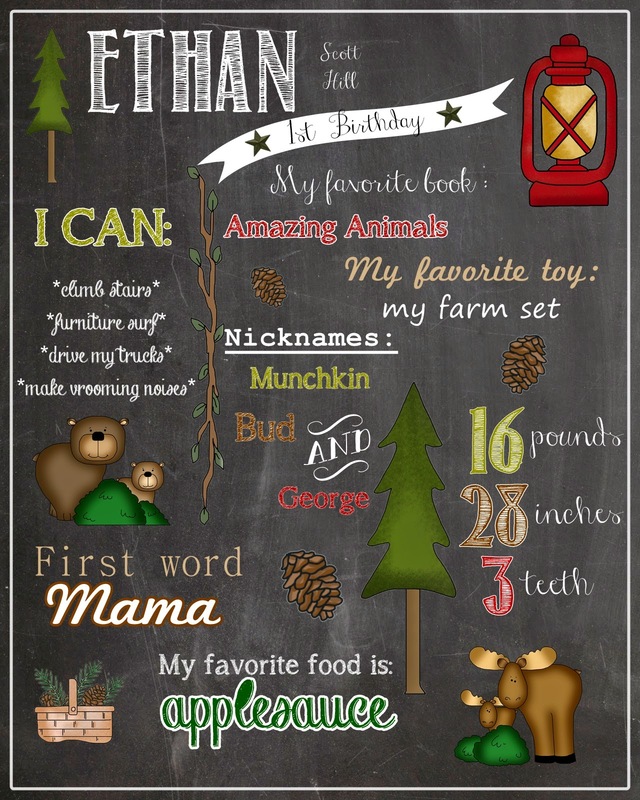 The graphics I used on the chalkboard printable can be found here and here. You can find the free animal tracks printables here. I made the banner from this digital kit. You put so much thought and effort into making wonderful party! It looks like it was so much fun! How delightful! Your cake turned out quite nice and the cookie was a great idea. You made a fun party for those two. Wow, amazing work on that cake!! All the decorations are so neat, Love the chalkboard plaque, so cool! Hello, my friend! It's so good to stop by for a visit...you have been in my thoughts lately. What a special party! And how neat that he could share the special day with his grandfather. Love your creativity!